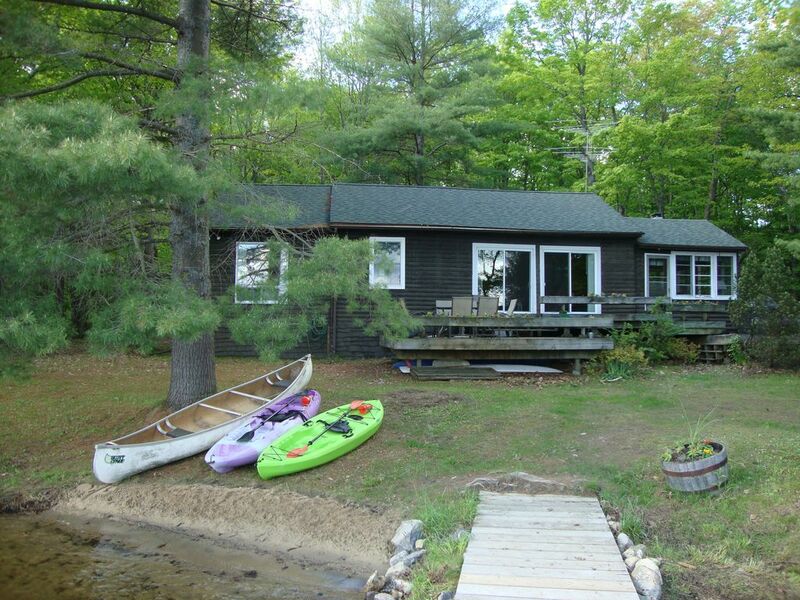 Lake Muskoka 4 BR cottage with all amenities and a sandy beach. Directly on Lake Muskoka. Safe, level lot surrounded by trees with plenty of privacy. Granite and stainless steel kitchen, dishwasher, washer and dryer. The main house has 3 bedrooms: a queen size master bedroom with a picture window overlooking the lake, a lakefront guest room with a queen bed which is perfect for 1-2 adults, and in the third bedroom, kids or adults can sleep in 2 twins. If you have guests, or someone wants more privacy, take advantage of the separate bunkie, with 2 twin beds, its own bathroom and shower. The bunkie has 2 rooms, and can sleep up to 4 people if you use the pull-out couch. Having a southern exposure in Muskoka is probably the main thing to look for if you like the sun. Here you will find expansive multi-level southern decks for relaxing or dining, and if you want to get away, go up to the boathouse sundeck where there is peace and quiet, a jaw-dropping view of the lake, a patio table for dining or entertaining, and lounge chairs for 4. Ever lay out at night looking for shooting stars? You'll find the meteor shower here every August in a cottage country starry sky. Roast marshmallows at night in our fire pit by the lake. The water is warm, thanks to the shallow bay, which also does a good job of keeping away roaming boaters. You can dock your boat here, or use our canoe and kayaks to explore the lake. Have your morning coffee at the end of the dock, and listen to the loons. Need to grab something? The General Store in Glen Orchard is 5 minutes away. Restaurants in Bala, Port Carling, Gravenhurst and Bracebridge are all within easy reach. Or enjoy nearby golf, tennis and hiking. This is the vacation you'll remember. I've been coming to Muskoka since I was 2, and was lucky to buy a cottage near Bala in 1987. I go there every chance I get, and our 3 kids spent their whole summers swimming, canoeing and being outdoors. Over the years we have upgraded just about everything. Lake Muskoka is a little piece of heaven on earth. Not too hard to get to, but a world away from the city. You want to be on one of the 3 big lakes: Muskoka, Rosseau or Joseph. They all connect in the hub of Port Carling, where shops and restaurants have sprung up and become a fun destination themselves. South facing decks and dock, for maximum sun. Privacy on all sides. Level lot, sandy beach, warm water shallow bay. Strong cell signal. Land line. Window AC available for one bedroom. Portable (rolling) AC unit can go anywhere. Ask for instructions. Double sink, disposal, instant hot water, range, microwave, dishwasher, fridge. Granite counter tops, stainless steel appliances. Kayaks and canoe are included. Bring your own life jackets, but we have a few in the boathouse. Power boat rental available in the area. The power boat on the property is not included. Extensive deck attached to main house Additional deck on boat-house roof. Dock. We had a wonderful, relaxing week at Peter's cottage! Listing description and pictures are very accurate and Peter was very responsive answering our questions. The cottage was very clean and well-stocked (kitchenware/gadgets, towels, games, VHS movies, canoe, kayaks, paddleboards, life jackets). Peter provided a great document outlining the rules and how everything works (garbage, dishwasher, etc). We were 6 adults and 2 dogs, so it could feel a bit crowded at times (bedrooms are small), but on the nice days we spent all our time outside so that didn't matter much! The cottage is located just a 5 min drive to Bala and 10 min to Port Carling, which had all the amenities we needed. The lake water is just terrific. Warm, clean and very swimmable. The bay is quiet and we only saw a few boats in our area during our stay. We took full advantage of the calm bay and spent so much time paddle boarding, swimming and kayaking. All in all, we enjoyed our time immensely and would definitely return! We loved our week at the Brook's cottage. We spent an awsome week. We were busy using the kayaks, the paddle boards, the canoe that came with the cottage and our boat that we brought over at the dock.When we felt lasy we just sat on the dock and looked at the ducks that came by everyday. The cottage is in the bay so it's a lot quieter than the lake. It also has shallow sandy beach which we loved to have. We finished the day around a fire and looked at the sky filled with stars. We even had the chance to see shooting stars a few times! The cottage is pretty roomy. It had everything we needed. (Although we spent every minute of the day outside!) It has a well equipped kitchen to cook our meals. The beds are very comfy. Our teenagers loved to have a place for themselves in the bunkie. Bala is a cute place to visit. It has a good size grocery store called Freshmart which is pretty close to the cottage. A few restaurants to choose from and a few boutiques as well. A coffee shop, and a ice cream shop too. We were so sad to pack our bags at the end of the stay and to leave this piece of paradis. Thanks Peter for giving us the opportunity to live in such a beautiful place. We truly appreciate. Thanks so much for your kind review. It was a pleasure having you visit our cottage. Everyone likes putting the teens in the bunkie, me too! You are welcome to return next year, just like the shooting stars. My husband, two young daughters and I had a wonderful week at this lovely Muskoka cottage this summer. We visited with our parents (children's grandparents) and siblings (kids' aunts and uncle) throughout the week, and everyone had a great time. We enjoyed roasting marshmallows in the fire pit at night; taking the canoe, kayak and paddle board out on the water; swimming off the dock and swimming platform; building sandcastles on the small beach; simply enjoying the beautiful view; and hanging out in the lovely cottage. All in all, a great time was had by all! We had a great weekend there! Everything in the house is very neat. The owner provides basically everything we needed. There are a lot of private space for you to relax and enjoy outside activities. The owner is so nice! He was kept on track with me with everything and provided instant help while we needed!!! This cottage property was exactly as advertised. We were 2 adults with 5 teenage boys (age ranging from 13-17) and two dogs and we never felt on top of each other. Lots of space inside and outside to find privacy, wonderful waterfront area - shallow and warm. Boys loved the campfire at night and running around in the woods playing kick-the-can. Dogs could roam & run free. Beds were comfortable, all amenities provided. Cottage was cozy and quiet at night for sleeping. Loved the deck on top of the boathouse, great sunning and views. Watched the meteor shower 3 nights in a row in the anti-gravity chairs!! Bala and Port Carling were a quick drive away. We would definitely vacation here again. Cranberry Festival in Bala the weekend after Thanksgiving. Select currency, Canadian dollars at www.homeaway.ca/cottage-rental/p354443vb or US dollars at www.vrbo.com/354443 Check-in at 4 pm, check-out at 11 am. Flat fee is for up to 6 people. Additional people are C$90 per person per night.